How do we approach urban planning and resource management in ways that preserve health and the environment while meeting our basic needs? The Ecocity represents an urban ideal that simultaneously envisions and plans for co-benefits and synergies between its various systems. It recognizes the holistic ways that transportation and land use planning, for example, impacts material, food, water and energy flows as they move through the city environment. 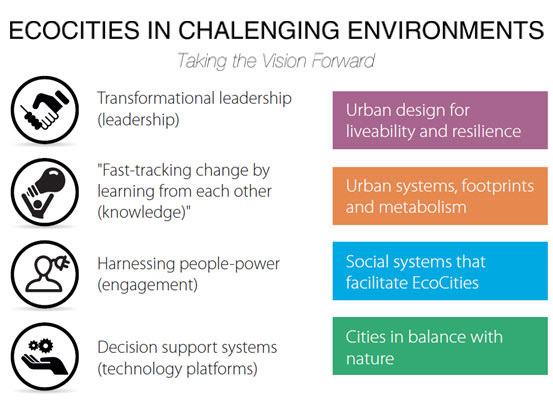 Cities and human settlements are urban ecosystems with both bio-geo-physical and socio-cultural elements. Urban ecosystems include concentrations of people and economies and the built environment, as well as the productive natural ecosystems generating the energy and matter required to sustain the whole. Only if the urban system is ecologically and socially complete and healthy does it have a chance of becoming self-reliant and sustainable. Accepted proposals will be further organized programmatically, with Day 1 focusing on highlighting the state-of-the-art, or Where We Are Now, Day 2 on Mainstreaming What We Know, and Day 3 on The Future of Ecocities. 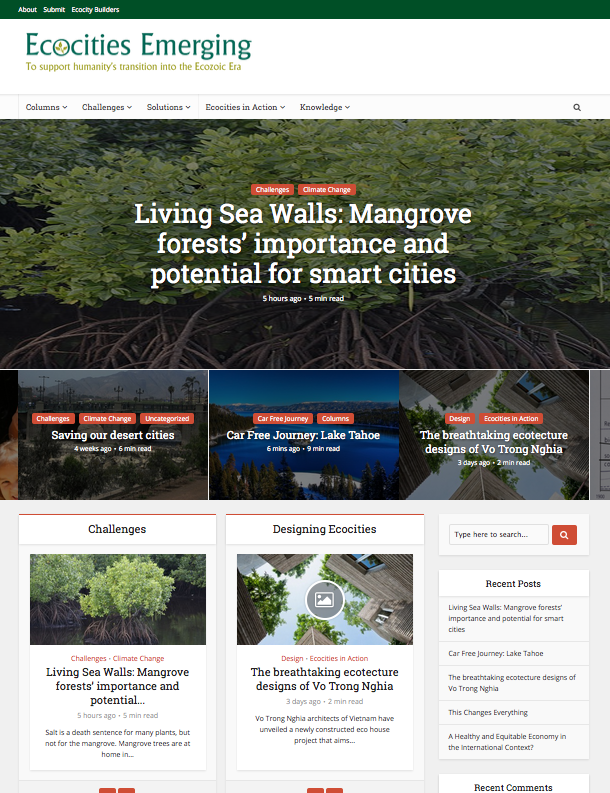 Please see the announcement and links in this edition of Ecocities Emerging, or go to www.ecocityworldsummit.com for more information. Who’s coming to Ecocity 2015 Abu Dhabi? Among others we will be joined by Razan Khalifa Al Mubarak, Secretary General, Environment Agency Abu Dhabi; Amine Bensaid, President of Mundiapolis University, Morocco; Ronan Dantec, French green EELV party Senator of Loire-Atlantique and vice-president of the French sustainable development committee; Tong-Yen Ho, CEO, Tianjin Ecocity, China; Anthony Mallows, Director, Masdar City; Simon Joss, Director, International Eco-Cities Initiative; Richard Register, Founder, Ecocity Conference Series and Ecocity Builders; Monika Zimmermann, Deputy Secretary General of ICLEI – local governments for sustainability, Dr Dieter Salomon, Mayor, City of Freiburg Germany; Arab Hoballah, Chief of Susatinable Consumption and Production, UNEP; Dr Jennie Moore, Director of Sustainable Development and Environmental Stewardship, British Colombia Institute of Technology; and Walter J Hood, Principal, Hood Design, Professor of Landscape Architeture and Environmental Planning and Urban Design, University of California at Berkeley. Keeper of the International Ecocity Conference Series, Ecocity Builders is a non-profit organization dedicated to reshaping cities, towns and villages for long-term health of human and natural systems. The Call for Abstracts for EWS 2015 is open. Visit www.ecocityworldsummit.com to learn more about how to submit ideas for actions, papers, presentations, or booths at the October conference in Abu Dhabi, UAE. 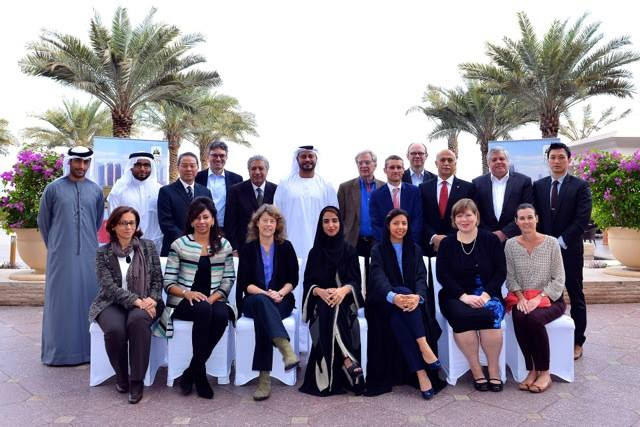 Group photo from recent meeting in Abu Dhabi for the Ecocity World Summit 2015 Advisory Committee. Among them is the Mayor of Freiberg, head of biodiversity program for the United Arab Emirates, head of the environment ministry of Abu Dhabi, ceo of the urban redevelopment authority of Singapore, representatives from Esri, ADNEC, Ministry of Foreign Affairs, Masdar Institute, CEDARE, AGEDI, UNEP, Estidama, Siemens, Urban Planning Council and more. Help us spread the word about Ecocity World Summit 2015! Do you belong to an academic institution or organization where others would be interested in the Ecocity World Summit? Will you be attending a meeting or conference where you would distribute flyers for EWS ’15? Please contact [email protected] to receive hard-copy or digital flyers to distribute. We can provide materials in English, Chinese, French, Spanish, and Arabic. Or, click this link to download flyers and cards to share freely! Today’s multi-dimensional crises require the social sciences to think outside their individual boxes and work toward a more inclusive, integrated and comprehensive “science of society.” So argue three authors (Garry Jacobs, Winston Nagan, and Alberto Zucconi) in a paper entitled “Unification in the Social Sciences: Search for a Science of Society” published in the October 2014 issue of Cadmus, the journal of World Academy of Art and Science. The following article illustrates the significance of this subject to Ecocity Builders. The article retains the style and format of its original form: a letter from Richard Register to author Garry Jacobs in response to reading the Cadmus paper. Perhaps a helpful new perspective I’m offering related to the “yin-yang symbol” and your unities coming together. A notion not mine but fitting much that I’m discussing in this letter, sparked in my thinking herein by your thoughts. Image by ZhengZhou, Wikimedia Commons. UN, New York City. Gamesmanship OK; Exaggerated gamesmanship – not so much. And the implications of becoming involved in exaggerated gamesmanship, going astray from the meaningful activities of our times that would be helpful actions in bringing about a sustainable or ecological civilization. If “dimensional pairs” is a good way of looking at things, exaggerated gamesmanship explains some solutions. Finally, I think a “Total Economics” made up of the all-embracing natural economics of physics, chemistry, ecology and biology and the later-to-evolve human economics is a helpful construct providing useful insights getting closer to the “true.” Seeing human economics also in transition from nature’s economics through “gift economics (Marcel Mauss and Karl Polanyi), which overlaps both natural and human economics, I believe also has great potential to explain things and resolve conflicts. Economics claims to be a social science, but as some have said, resembles more a religion. Nonetheless there may be a way of looking at economics in the way you look at social sciences that could help a lot. Seeing that sequence, early part linked to latter by gift economics, leading to monetized economics that could be called capital economics, and realizing the “poles” of capitalist vs. socialist economics amount to a new dimensional pair competing and cooperating in a game that can get exaggerated to destructive ends, might also help toward deciding what games make sense to engage – and make healthy, better ways of life into the future. We can endure and sustain if we play the games that fit our times and our position in evolution in time and that don’t get distorted by exaggeration. The International Ecocities Framework and Standards (IEFS) identifies human wellbeing and quality of life as an essential social feature. Specifically, “residents report satisfaction with their quality of life including employment, the built, natural and landscaped environment, physical and mental health, education, safety, recreation and leisure, and social belonging” (www.ecocitystandards.org). Human wellbeing depends on access to resources sufficient to lead a dignified life (Raworth 2013). This includes access to natural resources such as clean air, water and energy, as well as nutritious food. It also includes access to social resources including education, healthcare, employment and recreation, participation in decisions that affect one’s life, and freedom from persecution for one’s religious beliefs. Ecocities not only support wellbeing and quality of life through provision of affordable shelter and services, they also enable people to: access jobs close to where they live, breath clean air in car-free cities, and enjoy nature at their doorstep (Register 2006). This is achieved through compact design of the built environment that takes advantage of roof-tops (e.g., for parks and restaurants) and spaces below ground (e.g., for storage and shopping). Landscaped environments at grade blend with the natural environment to foster ecological connections that invite nature into the city (Register 2006). Residents of ecocities enjoy a high quality of life regardless of their socio-economic status. This means that social services are provided based on need, not just an ability to pay. An important measure for wellbeing is the Genuine Progress Indicator (GPI). Invented by Redefining Progress in 1995, the GPI considers changes in income distribution, volunteerism, crime, pollution and resource depletion as factors that affect quality of life (Redefining Progress 2013). This stands in contrast to Gross Domestic Product (GDP) which measures the sum of a nation’s financial transactions, but does not consider whether those contribute or detract from the wellbeing of citizens, particularly those who are most vulnerable. I’m glad to be back. In September, we moved from Baltimore, Maryland to Merritt Island, Florida (near Cocoa Beach, Melbourne, and the Cape Kennedy Space Center). I want to thank Naomi Grunditz for giving me a few months break. I’m happy to say that we are now basically settled in, and delighted to be in Florida (especially this winter) and resume Car Free Journey. Feel free to e-mail me with any comments or suggestions at [email protected]. Many visitors who live near the spotlighted destination will choose to drive there and make a day trip. For that reason, beginning with this month’s column, we will include information about Park and Ride lots (or other facilities) where visitors can leave their cars and use public transportation. In the past, we have focused on areas with good public transportation where it is easy to enjoy a weekend getaway, or up to a week, without needing to drive. However, at least in the United States, many cities and other destinations are car-oriented, and directions and suggestions for visitors are focused on how to drive there. (This is true for this month’s destination: Tampa, Florida.) Fortunately, walking, public transportation, and sometimes bicycling can provide an alternative-if we instead plan a visit where no driving is required. Some attractions may be difficult to reach without driving. Bicycling, taxicabs and car-sharing services (such as Uber and Lyft) can make it possible to reach state parks and other places that are not near public transportation. Fortunately, there is often so much to see and do that is near public transportation or walkable areas that you can have a wonderful visit without needing to drive. Remember that you are free from high gasoline and parking costs. Traffic delays are something other people have to worry about. Walkers, bikers, and public transit users are often friendlier (with time to talk, instead of waiting for the light to turn green) than other drivers. By walking, biking, and using public transportation whenever possible, each of us is helping to make our world more ecologically friendly-and a good place to build and sustain ecologically healthy cities and other communities. Now, let’s begin our Car Free Journey. Our March 2014 destination is Tampa, Florida. :: Rent at the Ecocity CoLab! ecocity builders members receive benefits including discounts to all Ecocity World Summit events. Membership is affordable and easy. Ecocity World Summit Strategic Committee meeting in Abu Dhabi – Kirstin Miller will attend the 3rd Strategic Committee planning meeting of the Ecocity World Summit. The first call for abstracts for the fifth International Smart and Sustainable Built Environment Conference (SASBE2015) is now open. SASBE2015 is hosted by CIB (International Council for Research and Innovation in Building and Construction), the CSIR and the University of Pretoria and will be held on 9, 10, 11 December 2015, in Pretoria, South Africa. Founded in 1992, Ecocity Builders is a nonprofit organization dedicated to reshaping cities for the long-term health of human and natural systems. Education and technology to increase transparency, access, and collaborative creation of sustainable and equitable communities. Rent a desk or two at the Ecocity Builders office. Collaborate, innovate, and create with us!